Born Esther Pariseau, Mother Joseph made monumental contributions to health care, education, and social projects throughout the Northwest. 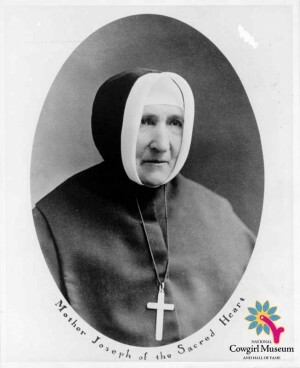 The daughter of a French-Canadian carriage maker, she joined the Sisters of Providence and was sent to Fort Vancouver to oversee construction of a convent and schoolhouse. As the architect, construction supervisor, and chief fund raiser, she built nine schools, fifteen hospitals and a mission, becoming the first to provide care for the orphans, elderly and mentally ill in Washington Territory.